Whenver someone talks about dining at Orchard Road (or anywhere else nearby), most people are quick to assume that it would be an extravagant wallet-damaging meal. While there are many fine dining restaurants in this vicinity, there is also a sheer number of budget-friendly eateries. Yes, you can find a bowl of noodles at S$5 and below if you search hard enough! From Far East Shopping Centre, Golden Mile Complex to Orchard Towers, here are 8 Old Shopping Malls In Singapore where you can find lots of cheap food options. Cuppage Plaza might be notorious for its Japanese restaurants and Japanese KTV bars, but the old mall is also home to economical food stores on its first floor, namely Orchard Yong Tau Fu and Angel Kitchen. Far East Plaza is every teenager’s go-to paradise for trendy accessories and clothing, but the shabby-looking shopping centre also sells cheap Asian fares at its ground storey and top storey. 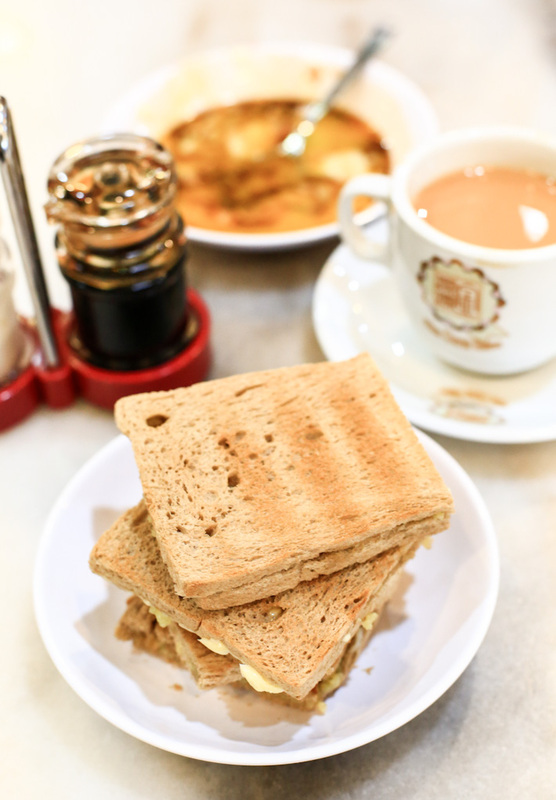 We love Hainanese Delicay’s fragrant chicken rice, Graffiti Cafe’s wanton mee, Good Morning Nanyang Cafe’s kaya toast and Hong Hu Express’ minced pork noodles. Far East Shopping Centre is dark and gloomy – not quite a destination you ever thought of dining at. But hidden inside this dimly lit mall is a plethora of economy rice and yong tau foo stores where you can have a satisfying meal at just S$4. A trip to Golden Mile Complex is akin to visiting The Land of Smiles. The mall is dotted with endless Thai restaurants, many which open till very late or are open 24/7. 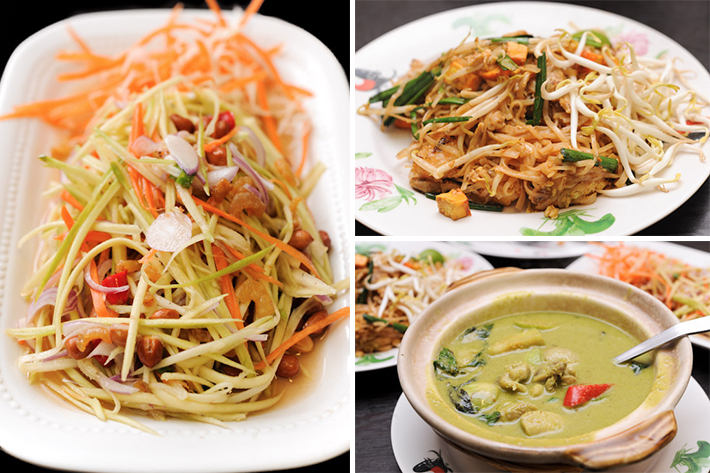 For a cheap Thai meal, head over to Golden Mile Complex’s Nana Original Thai Food and Diandin Leluk. We bet most of you have walked past Midpoint Orchard for many years, but actually never set foot in this unassuming mall. After all, nobody talks about Midpoint Orchard. You probably did not even know about its existence! But located in the basement is JTown Cafe, which serves quite a fantastic spread of Indonesian delicacies at affordable prices. When the beauty parlours, tailor shops and tuition centres at Orchard Plaza shut their doors, skimpily-clad exotic-looking oriental women are seen lurking around the shopping centre. Dodgy businesses aside, there are still eateries that you could visit for a cheap, good meal. Visit the 24/7 Al Madinah Restaurant and treat yourselves to tom yam soup and murtabak. If you thought visiting Orchard Plaza at nighttime was intimidating, then you clearly have yet to venture into the infamous Orchard Towers. Admittedly, a trip afterhours here sunset could make one feel queasy. If that issue is a concern, why not visit in daytime and check out the basement’s selection of cheap hawker fare and Thai restaurants. Sunshine Plaza has the largest number of printing shops in Singapore. The next time you are running your print errands, do make it a point to have a meal there. After all, Sunshine Plaza is also where you can fill your tummies up with delicious but inexpensive food. 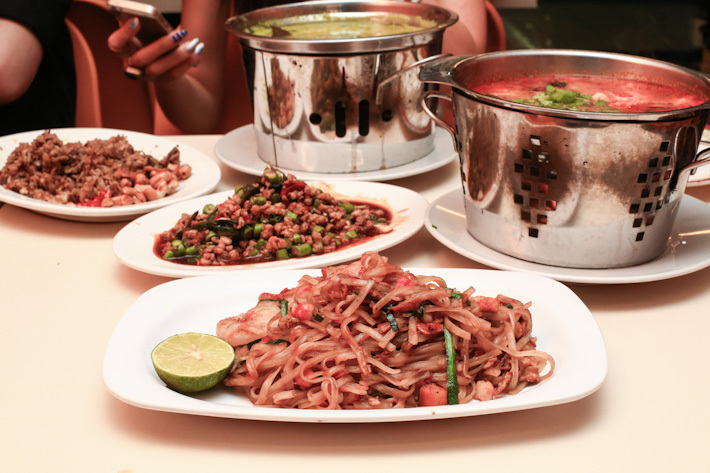 Parklane Zha Yun Tun Mee House and Thai Gold Food are two recommended value-for-money eateries.